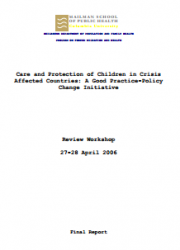 This workshop was convened in April 2006 to engage senior practitioners and policymakers in the field of care and protection in the development of the CPC good practice-policy change initiative. The workshop reviewed conceptual frameworks for work in this field and developed a working definition of protection for the purposes of the CPC initiative. Presentations highlighted key issues raised by literature review and practice experience in four thematic areas: emergency education, psychosocial work, sexual gender based violence (SGBV) and children associated with fighting forces. This is the final report for the Review Workshop, which includes strategies for establishing the fieldwork partnerships required for advancing the CPC and strategies for maximizing practice and policy influence of the work.